Chieko Egged worked in the beauty industry for twenty years. During this time she was exposed to many synthetic chemicals which caused her to develop severe eczema. Although she was married to a dermatological surgeon and received the best care, the steroid medication and treatments did not heal her condition. Chieko made a complete lifestyle change by moving to Hawaii. She studied traditional Hawaiian plant properties, naturopathy, aromatherapy, and Ayurveda while working with experts including holistic doctors and kahuna healers. She learned about blending botanical ingredients in ways that cause positive chemical reactions and brought out the best properties of each ingredient. 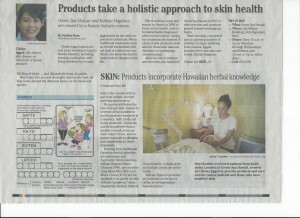 With this knowledge, Chieko was able to heal her skin condition and Kahala Organics was born. 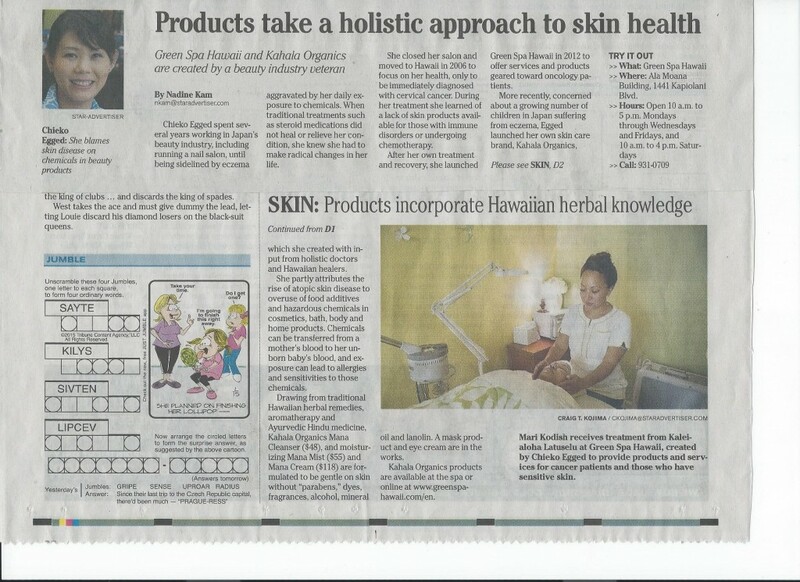 She developed this line of holistic skin care products that are safe and effective against aging through the healing power of nature’s ingredients and the mana of Hawaii without being harsh or damaging. She closed her salon and moved to Hawaii in 2004 to focus on her health, only to be immediately diagnosed with cervical cancer. During her treatment she learned of a lack of skin products available for those with immune disorders or undergoing chemotherapy. After her own treatment and recovery, she launched Beauti Therapy LLC and opened Green Spa Hawaii in 2012 to offer services and products geared toward oncology patients.